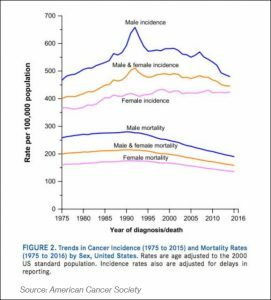 Cancer hasn’t gotten knocked out of its spot as Americans’ No. 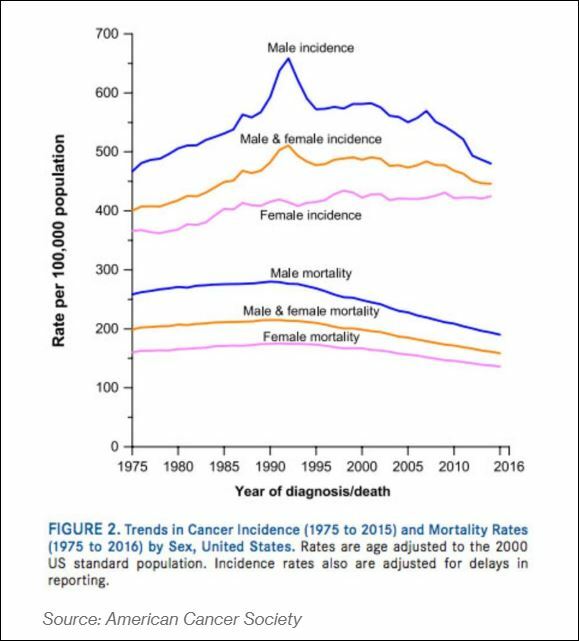 2 killer, but health officials have delivered some good news about the disease that once was considered irreversible in its lethal course: Cancer deaths rates have fallen now for a quarter of a century. Still, 1.7 million Americans likely will be diagnosed with cancer this year, and the disease will kill more than 600,000 patients — meaning 1,666 people per day in this country will die of cancer. More patients dodged cancer because they didn’t smoke or reduced their tobacco abuse, health experts said. They emphasized that dips in smoking played a big part in sizable declines between 1990 and 2016 in lung cancers among men (a 48 percent decline) and women (down 23 percent). Their message was plain: If you don’t smoke, don’t start. If you do smoke, quit or cut back as much as you can. While preventive steps helped reduce deaths from colorectal, breast and prostate cancers, the experts also cautioned that Americans shouldn’t subject themselves to over screening or over testing for the disease. Still, sensible early detection and treatment has bolstered favorable outcomes, and patients should consult with doctors about ways to protect themselves without costly, invasive, painful, and unnecessary procedures that may produce as many false positives as findings of serious cancer. Medical scientists have provided new guidelines for testing for two cancers that hit women (breast) and men (prostate) hard. Cancer experts also issued cautions on how at least three challenges could undercut or even reverse progress in combating the disease: the rise of obesity and its related cancers; the problems faced by poorer and poor Americans in accessing and affording medical care; and persistent issues with liver infections (Hepatitis C) and how these raise deaths due to cancers in this organ. There’s a caveat, however. Those gains have been reaped mostly by the well-off. While racial disparities have begun to narrow, the impact of limited access to treatment for the poorest Americans has increased wealth-based inequality …Health insurance and access to care can be an issue in some poor and rural portions of the country, where there are higher death rates of colon, cervical and lung cancers … While poverty was … associated with lower rates of cancer mortality prior to the 1980s, that trend has since reversed, due in part to changes in diet and smoking as well as screening and treatment rates. While medical providers at some point must reckon with the consequences of soaring costs, all the rest of us must do what we can to prevent cancer and treat it early. As mentioned, cutting down or out smoking can make a big difference. So, too, can common sense and moderation in diet, exercise, weight regulation, and alcohol use. We can start now and make healthful improvements part of our 2019.